Ryder and I both had Presidents Day off on Monday, so we headed up to Muir Woods for a hike. The redwoods are very pretty, and we hiked for a while along a babbling creek. Our hike took us through some of the redwoods and then out into Mt. Tamalpais State Park, which meant most of our hike was sort of an average, partially sunny-partially forested hike, and not that many redwoods. The first part of the hike by the redwoods and the creek was my favorite part, but if I want to see redwoods again I would head to Big Basin instead of Muir Woods – it has more extensive trails and is easier to get to for us. Overall, though, our Muir Woods hike was a lovely way to spend a day off. 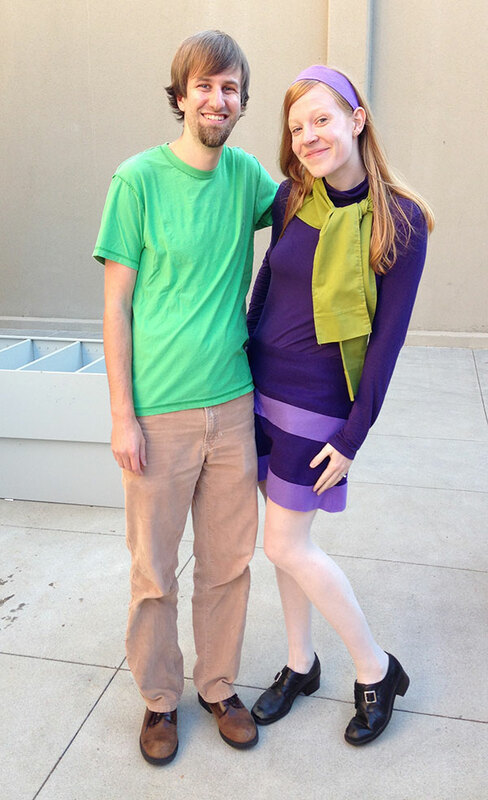 Happy Halloween from Shaggy & Daphne! Recently, Ryder and I have done some hiking a bit closer to home: the Pearson-Arastradero Preserve and Foothills Park, both of which are run by the city of Palo Alto and are within a few miles of our home. Arastradero is mostly rolling grassland hills, with some views across the Bay. Foothills Park (at least the part we hiked) was more varied – steeper hills, a stream bed that looks like it will be quite active when it starts to rain again, and a nice assortment of flora. Plus, it’s start to look a bit like fall, with some leaves turning red! In all, we found Foothills Park to be a much more interesting place, and we’re looking forward to going back in the winter when the stream is running again. There are a few more photos of these two hikes here. I also posted some photos from our Winck family reunion, which involved more hiking and some pretty cool thunderstorms. A few weeks ago, we drove east to Kings Canyon National Park, where Ryder’s parents had lovingly prepared a tent for us in the 6500′ elevation campground of Azalea. It was a great campsite for our first camping trip in years. On day two, we drove along the Kings River through Kings Canyon, to the end of the road and the trail to Mist Falls. Mist Falls – can you find Ryder? Day three, we first scaled Moro Rock, a granite rock overlooking the park. Having sufficiently warmed up, we hiked through the Giant Forest in Sequoia National Park. This was my favorite hike. I loved how sparse and quiet the forest was. Watching a bear climb a tree! These were two beautiful parks. The mountains reminded me of Yosemite, which makes sense since the parks are in the same neck of the woods, so to speak. The sequoias were amazing to see – some of the trees are over 30′ in diameter at the base! And most of the hikes we did were very quiet, with only a few other hikers on the trail. More pictures here, if you’d like to see more of our trip! A few weeks ago, our dear friends Jordan & Elise came for a visit! They suggested a trip to Yosemite, which we dared do in a day (it’s a 3.5 hour drive each way). We were a bit wiped out the next day, but it was definitely worth it! This place is beautiful! Yosemite Valley. We spent a while driving (and walking) around the valley, looking at the mountains and waterfalls and generally marveling at the beauty. The lower part of Yosemite Falls. Yosemite Falls in total is 2,425 feet tall. Lower Yosemite Falls is only 320 feet tall. There’s a trail that leads to the base, and the top, of Upper Yosemite Falls, but we weren’t up for a strenuous, 6 mile hike that day, so we stuck with the view of the lower falls. Tunnel View – named because it’s at the exit of a tunnel. From here, you can see many of the famous Yosemite landmarks – Half Dome in the distance, El Capitan on the left, and Bridalveil Falls on the right. Beautiful. After exploring the valley, we drove up Glacier Point Road, to Glacier Point, which overlooks Yosemite Valley from 7000 feet. One of my favorite parts of our day exploring Yosemite was that we got to see a lot of the park from different vantage points – we saw Yosemite Falls from the valley floor, from the base of it, and from atop Glacier Point. There are more pictures here if you want to see more of Yosemite. I hope we find another chance to go back – I would love to hike to some of the other falls and see more of the park!